Bill goes through slavish and completist phases in his trash television habits. At the moment it's all about 'Spongebob Squarepants'. A few months before that he was curiously hooked to 'Winx Club' or 'that slutty fairy show' as his parents liked to privately refer to it between themselves ('I don't know WHY I like it- I just do' says boy gazing intently at scantily dressed fairies). Sometime before that he was very into an obscure Australian show called 'Kid Detectives'. I liked this one (although I'm also quite partial to the odd Spongebob). In each 15 minute episode kids solved a series of 'real' crimes using proper basic forensic science eg. 'who broke mum's plantpot? Let's show you how to take earth samples from tyre imprints' etc: A kind of 'CSI-lite' for the under-10s. 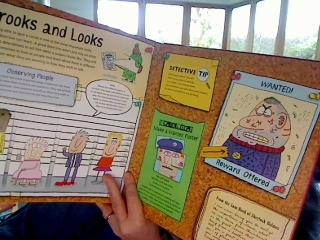 In honour of this interest and in anticipation of my own future as Mother of Detective Superintendent I bought him 'How to be a Detective' for Christmas by Dan Waddell, illustrated by Jim Smith ('It's the same person as the 'I am not a Loser' guy Mum' 'Is it? So it is.' Good eye for illustrative style my boy). This is an irresistable lift the flap book with bells and whistles for the over-7s (there should be more grown up lift-the-flap books I reckon- we all love 'em)(I am using a lot of brackets today). Each page is crammed with a mixture of basic forensic science, practical activities to try and the basics of deduction in a really attractive format. There's also a pull-out case to solve, a make-your-own periscope and an ink pad for fingerprinting members of your household (Note- do not give when guests in household with white sofas). Lots to enjoy. We've now moved on to an appreciation of Simon Cheshire's 'Saxby Smart' books. Bill and I read them together and try to solve the clues to beat schoolboy detective Saxby to his conclusions. These are really enjoyable reads- three cases to each book- and so much more soothing than say, a Patricia Cornwall; not a festering corpse in sight. I think we might form a Mother and Son agency. We're hot. Okay some crazed photos are going to follow because my proper camera has broken. To get you in the mood- here's a little teaser- a High Concept edible book. Name the title. Thanks for the shout out about the Edible Books Festival. 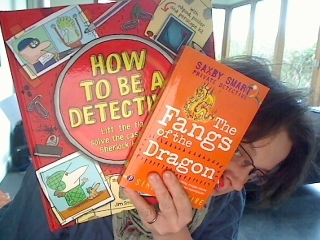 Now off to track down a copy of How to be a Detective as I think my eldest will love it! Thanks Zoe- I'm sure she would.